THE BLEACHER BRIEFINGS: Blame Bobby V? Gimme a Break! Blame Bobby V? Gimme a Break! "This is the weakest roster we've ever had in September in the history of baseball." Manager Bobby Valentine's words echoed what most members of Red Sox Nation were already thinking. As much as the fans like to deny it, the 2012 Red Sox have fallen from grace. They started the season off poorly, continuing the never-ending disappointment following their September 2011 collapse. There were an obscene amount of injuries to star players. Nothing seemed like it could go right for this poor Sox team. The terrible team chemistry didn't help matters either. 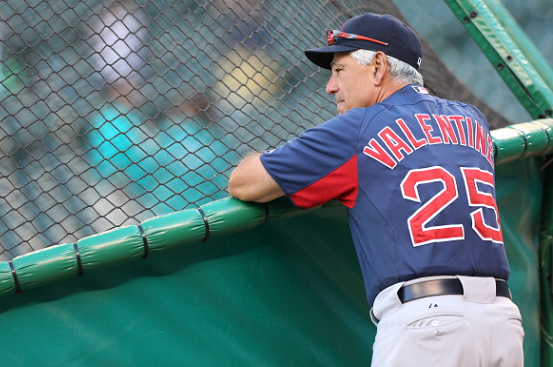 Bobby Valentine lost the respect of many players and fans after his comments about Kevin Youkilis at the start of the season. Whether or not the comments were justified depends on who you ask. Everything went downhill after that. Pitchers fell apart. A star would rise only to be torn down by injuries. And the world demanded Valentine's head on a silver platter. Things got worse after word spread of a secret meeting between players and the front office. Now Red Sox fans had all the ammo they needed for their hate against the manager. But is Valentine really the problem? A manager's job is to set the lineup and to make the right pitching moves throughout a game, but it would be hard to find a manager that could succeed with a team ERA of 4.56. As terrible as this season has been for everyone involved with the Red Sox, someone has to take the fall. But the fact remains that Bobby V isn't the one throwing the pitches or swinging the bats. He's certainly not making important decisions concerning the team. So does he really deserve the complete hatred he is receiving from Red Sox Nation? Should the blame fall on the players? What about the front office? As much as people like to place the blame on Bobby V, he is nothing more than a scapegoat. And unfortunately for the Valentine haters, he will more than likely be the manager for the 2013 season, unless the Red Sox are given a suitable replacement candidate, such as Mike Scioscia. Or perhaps somebody who can give them a few World Series championships. What most Red Sox fans tend to forget is that the front office hired Valentine. Former manager Terry Francona allowed the World Series contending 2011 team to undergo a meltdown of epic proportions. The players had no discipline and the fans demanded a change. That change unfortunately required a new manager. As usual, the captain went down with the ship. And as tough as this season has been to watch, things could possibly get worse -- if the front office keeps making these drastic changes. While Bobby Valentine may not have seemed like the best option to fans, the front office clearly thought he was a better option than Francona. For that reason alone, Red Sox fans need to place their blame on the higher-ups, not Bobby V.
Doesn't help that they traded half the team to the Dodgers either. Absolutely not. Then again, I was really glad to see Beckett go. I was so angry about Gonzo though. I don't think he SHOULD be fired, but I think he WILL BE fired. As bad as they've looked, I don't see how he keeps the job. Although, I dunno who they should replace him with.